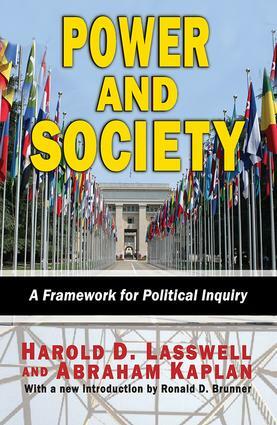 In Power and Society, Harold D. Lasswell collaborates with a brilliant young philosopher, Abraham Kaplan, to formulate basic theoretical concepts and hypotheses of political science, providing a framework for further inquiry into the political process. This is a classic book of political theory written by two of the most influential social scientists of the twentieth century.The authors find their subject matter in interpersonal relations, not abstract institutions or organizations, and their analysis of power is related to human values. They argue that revolution is a part of the political process, and ideology has a role in political affairs. The importance of class, both as social fact and social symbol, is reflected in their detailed analysis, and emphasis on merit rather than rank, skill rather than status, as keystones of democratic rule.The authors note that power is only one of the values and instruments manifested in interpersonal relations; it cannot be understood in abstraction from other values. Lasswell and Kaplan call for the replacement of "power politics," both in theory and in practice, by a conception in which attention is focused on the human consequences of power as the major concern of both political thought and political action. The basic discussions of core concepts in political science make Power and Society of continuing importance to scholars, government officials, and politicians.